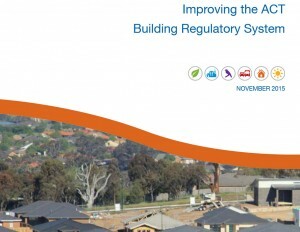 This review of the building regulatory system is part of ongoing ACT Government reforms to ensure buildings meet contemporary standards – and the expectations of the community, industry practitioners and businesses and government alike. The Government is proposing reforms to the regulatory system, with the primary focus on residential buildings—single dwellings, townhouses and apartment buildings—and management of retention and project payments. Some of the proposals also apply to non-residential buildings.